There was a sparrow who lived on a tree. She was eagerly waiting in her nest for her eggs to hatch. While she was busy warming the eggs, her husband was away to fetch some food for her. A wild elephant was on rampage nearby. The elephant shook the tree violently and due to that the sparrow’s nest was badly destroyed. All the eggs were shattered into pieces. The sparrow was very sad and was crying inconsolably. When her husband returned, he also felt very sad. Both of them wanted to take revenge from the elephant. They went to one of their friends; a woodpecker and told the whole story. 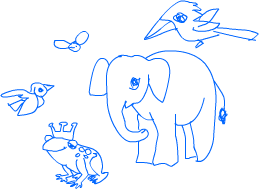 They wanted some help from the woodpecker in teaching a lesson to the elephant. The woodpecker had two more friends; a bumblebee and a frog. They made a plan for the elephant. The bumblebee was the first to work on the plan. It started humming a song in elephant’s ears. The elephant loved the music in his ears. While he was engrossed in the music, the woodpecker began to work on the next part of their plan. The woodpecker scooped both the eyes of the elephant. The elephant was in great pain. The frog then came with its gang and started croaking near a quicksand. On hearing the croaking of frogs, the elephant thought of some pond nearby. He followed the voice of croaking frogs and was trapped in the quicksand. Thus, the elephant died a slow and agonising death in the quicksand.